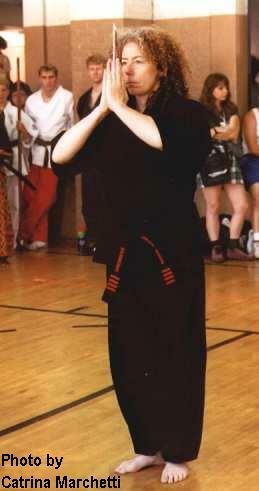 Professor Coleen Gragen was the founder and head instructor of Hand to Hand Kajukenbo Self Defense Center. She trained in the martial arts for over 25 years and held an 8th degree black belt and the title of “Professor” in Kajukenbo. She is the first woman, and one of only five martial artists, to be given the title in the Gaylord Method of Kajukenbo. At the same time that Grandmaster Charles Gaylord presented her with the title of Professor, she received Pacific Association of Women Martial Artists’ (PAWMA) Lifetime Achievement Award in recognition of her outstanding efforts in promoting and teaching martial arts for women. Professor Gragen received her black belt in 1978 from Professor Barbara Bones in Eugene, Oregon. In 1980 Professor Gragen moved to the San Francisco Bay Area and opened Hand to Hand at our present address of 5680 San Pablo Avenue in Oakland, California. She is recognized nationally and internationally for her martial arts and teaching skills and was regularly selected to teach at the National Women’s Martial Arts Federation (NWMAF) and the Pacific Association of Women Martial Artists (PAWMA) yearly training camps. She was also past chair of the NWMAF. In addition to teaching at Hand to Hand, Professor Gragen taught martial arts and self defense at Mills College in Oakland for several years. She was so influential, loved, and respected at Mills that the College now presents an annual award in her name, The Coleen Gragen Award, to be given to a Mills faculty, staff, or student who exemplifies Professor Gragen’s lifelong advocacy for women. Professor Gragen was, and is, a well-known and well-loved instructor both nationally and internationally. After 1976, her focus changed to teaching. Along with Sifu Joyce Towne, Professor Bones started Amazon Kung Fu in Eugene, OR. That school continued until the mid 1980s, and Hand To Hand Founder Coleen Gragen was one of her original students. A true leader, Professor Bones has for many years willingly and selflessly shared her qualities of courage and vision with her students. Through her lineage and her inspiring and committed teaching skills, three prominent Kajukenbo schools have risen — Hand to Hand, Seattle Kajukenbo, and Seven Star Women’s Kung Fu — from which more than 65 Black Belts have emerged. Through the martial arts and the wisdom and teachings passed down by Professor Bones, these training communities have made significant advances and contributions to the women’s martial arts movement, the welfare and wellbeing of their respective communities, and the art of Kajukenbo as a whole. Great Grandmaster Gaylord actively trained in the art of Kajukenbo for over 50 years. In 1980, he received his 9th degree Black Belt from the Kajukenbo founder. Great Grandmaster Gaylord began his training in Hawaii under Kajukenbo Black Belt George (Paul) Seronio. In the early 1960s he moved to Northern California where he began teaching in San Leandro. He brought to the mainland the effective hard and heavy hitting style of Kajukenbo which he had learned from his instructors. Over the years, he developed his internal and external martial art skills through practical application training, along with meditation and constant research of “mind over body” studies. His ki or chi demonstrations have become legendary. His continued training of Kajukenbo enabled him to develop his own method of Kajukenbo. The Kajukenbo Association of America (KAA) calls it “Gaylord’s Method.” In September 1995, the KAA and all of its Black Belts promoted Great Grandmaster Gaylord to the honorary rank of 10th degree Black Belt. The KAA believed that this was necessary to ensure the desired level of excellence for their organization. Great Grandmaster Gaylord produced countless quality black belts who have become top competitors and instructors. To ensure the quality of his instructors, he held a monthly Black Belt Class, where he taught over 30 black belts who have schools located in the Western United States. He also provided special seminars to those schools that could not regularly train with him. Great Grandmaster Gaylord passed away on the morning of August 4, 2009. His incredible contributions to the world of martial arts, and Kajukenbo in particular, live on in the countless students who continue to practice the Gaylord Method of Kajukenbo.